EFI - Matan Blog Article - The Only Hybrid Printer With No Compromises! The Only Hybrid Printer With No Compromises! In the beginning (it wasn’t that far back. Just 10 years ago), there were only two kinds of Superwide printers: Roll-to-Roll (R2R) or Flatbed. 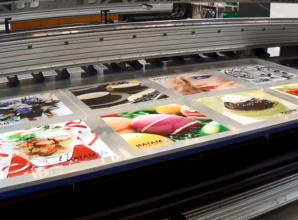 Pure R2R printers could only print on flexible roll media while true flatbeds were dedicated to printing on rigid boards. Print providers had to choose either the one or the other. Then came the hybrid printers. Those printers allowed print shops to diversify the products they offered, without having to invest too heavily in new machinery. However, like all cross-breeds, the hybrid printers represented certain compromises. None of them were quite as good at both tasks. EFI™ Matan now introduces the new revolutionary Vacuum Plate System that turns EFI Matan high-volume printers into a true flatbed. Yes, a true flatbed printer, with zero compromises. With this new system, the EFI Matan printers are capable of printing on rigid media and on thin media sheets at an outstanding quality. The vacuum plate is very easy and quick to install. 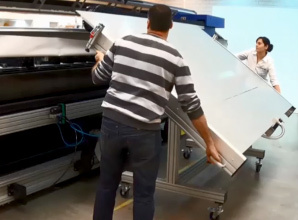 It is mounted onto a space-saving foldable cart and attaches to the printer via pneumatic and electric quick connections. Just roll it in, connect the tubes and you are good to go. The results are breathtaking! 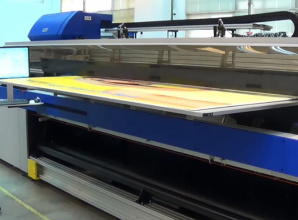 Supported media includes sheeted paper, sheets of clear media such as PVC or static cling, foam-board, coroplast, milky backlit, Foam PVC, and many more types of thin media and rigid boards. The new system is compatible with printer models EFI Matan iQ (UViStar2), EFI Matan 8Q (UViStar Pro-8) and EFI Matan 8QW (UViStar Pro-8W).